Anthony Rizzo (and Cubs fans everywhere) celebrated Chicago winning the NL pennant, but will the team’s World Series luck change as well? No matter what happens at the end of this year’s World Series, a curse is getting broken. On Tuesday, the Chicago Cubs will open up proceedings against the Cleveland Indians, and by Nov. 2, one of them will have claimed the title. For two teams with the some of the worst championship luck in all of baseball, this series will offer long-awaited catharsis for one — and even more misery for the other. As expected, a team’s probability of winning the World Series increases as its roster gets stronger. But the effect of having a good team is completely overwhelmed by the number of opponents a squad must face to get to the World Series. Consider the worst and best teams to have ever made the playoffs by Elo’s reckoning: the 2005 San Diego Padres (with a rating of 1489) and the 1906 Chicago Cubs2 (1635). In a two-team playoff system — which is what the 1906 Cubs faced — that Padres team would be expected to win the World Series only 23 percent of the time, while the Cubs had a commanding 72 percent chance of taking home the title. In the current 10-team playoff system, the Padres’ odds would shift down to 4 percent — but the 1906 Cubs would drop much more dramatically, all the way down to 28 percent.3 That’s why the modern playoffs are a crapshoot: No matter how good a team is, by the time it gets to the postseason, its chance at the championship isn’t radically better than that of the worst team in the playoffs. 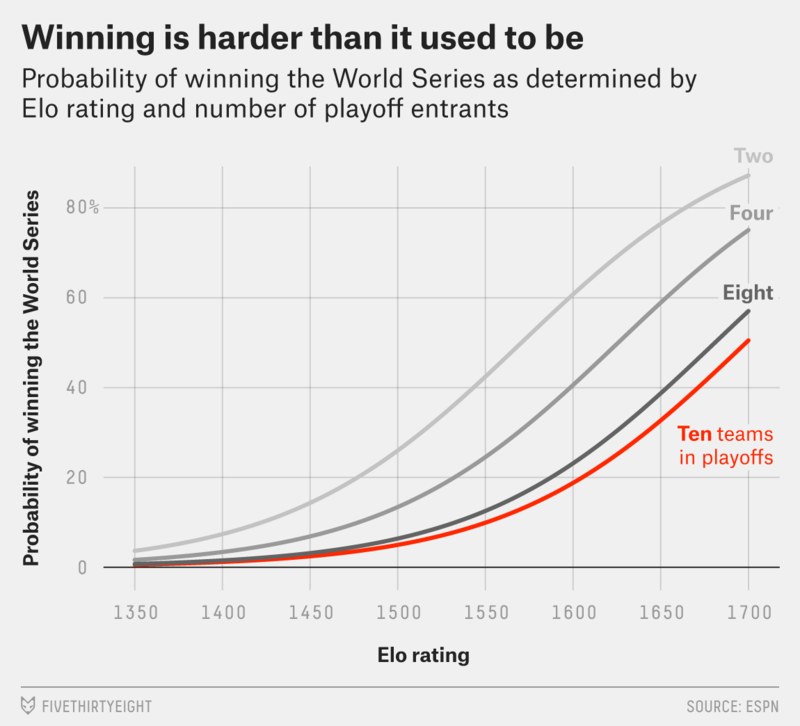 As a corollary, any ballclub that appears in the postseason often enough — no matter how mediocre its teams are — should eventually be guaranteed a World Series win. But for more than a century’s worth of Cubs squads, no level of greatness has been able to get them over the hump. I determined just how unlucky each franchise has been over its postseason history by taking its Elo rating and the size of the playoff field and then calculating how likely the team was to win the Series each year using the process I outlined above. I added up those probabilities from all the years in which a World Series was held and compared them with how many titles the teams actually won, and I found that the Cubs are the unluckiest team of the last 113 years. Win totals include 2016, except in the cases of the Cubs and Indians. Just based on the pretty-good teams the Cubs have featured in their 18 playoff appearances, my model expected them to win six or seven championships. Instead, they’ve only won two since 1903, and both were more than 100 years ago. (Notably, this year’s Cubs triumphed in the NLCS over the second-most-unlucky team, the Los Angeles Dodgers.) The Cubs have had more years to be unlucky than most teams, since they’ve existed for a long time. But even on a per-playoff-season basis, the Cubs have been the least fortunate franchise in baseball. One of these franchises will see its championship drought end soon. If the baseball gods have any mercy, they’ll reward the Cubs for assembling what will probably go down as one of the best squads of all time. Yet, as a Cubs fan myself, I’ve been trained to believe that seasons can only end in heartbreak. But whether or not it ends this year, statistically speaking, the curse can’t persist forever. Probably. I used a logistic regression, with end-of-season Elo rating and log-transformed playoff field size as predictor variables, on all playoff teams going back to the first World Series in 1903. Without taking into account the specifics of the playoff bracket, including teams’ starting rotations, my simplified model would have given this year’s Cubs and Indians a 13 percent and 8 percent chance of winning the World Series, respectively, before the playoffs began.